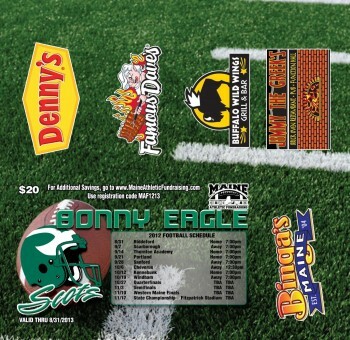 Maine Athletic Fundraising takes great pride in providing teams and groups with the best products on the market. What people appreciate when working with us is the brief, individualized fundraising program that we use. Our fundraisers only last 7-21 days so coaches/instructors and their teams can quickly return to concentrating on their season. Maine Athletic Fundraising will work with you every step of the way as we understand that you can’t be expected to be an expert in the fundraising business – that’s what we do best. We want you to succeed just as much as you want to succeed. The great thing about Maine Athletic Fundraising is that no matter what product you sell, the program is always similar. Listed below are a few key components of our fundraising program. We understand the importance of being prepared, which is why we schedule coaches/instructors meetings prior to the fundraiser. We personally come and meet you! The meeting takes 15-20 minutes to review important dates, set goals, go over the prizes that we will give to the team/group for being successful, and most importantly, we emphasize in this meeting what it takes to maximize the fundraiser. The next part of the program is kicking off the fundraiser. This is where a Maine Athletic Fundraising representative visits the team/group, explains all the details of the fundraiser, and gets it started. This takes about 20–25 minutes. The representative and coach/instructor will set forth the expectations of the fundraiser and give the team any other info they might need to go out and do a stellar job. Checkpoint(s) are very important to your program. It’s a midway point to see how the team/group is doing with hitting their goals, making sure that we still have 100% participation, and to kick the team into overdrive for the last few days before this program is over. The blitz is when the team/group wears jerseys and canvasses the area selling for a period of time. Everything concludes at this event and the team/group walks away with their profit. In addition, prizes for meeting and exceeding expectations are given to the participants after the blitz. We give out all prizes on the day of the Blitz. These prizes are provided by us, so your team/group doesn’t have to worry about losing any profit on the fundraiser. We’ve found that cash prizes are a great way to motivate sellers, and we also like to give away personalized gear to participants who exceed expectations. Free product is also given to participants. 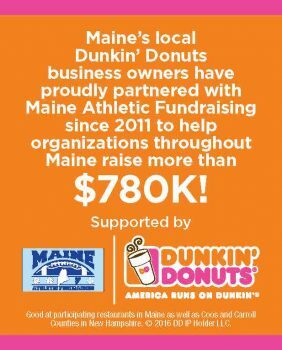 Without a doubt, Maine Athletic Fundraising will give more back in prizes/incentives than any other company you could ever work with! Please compare us! We understand that one of the most important and complicated parts of doing an edible fundraiser is organizing the delivery. We’ve heard about the nightmares that other teams/groups have gone through because of the delivery. That’s why we feel it’s important to help out with the delivery, not only by organizing the shipment, but by being there during the delivery process. This is just one more thing we do to offer you the best service we can. 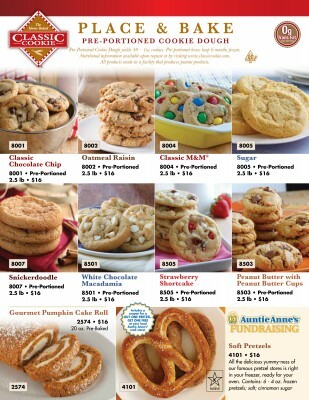 Please check out our impressive list of proven fundraising products below, with more being added all the time. An exciting brand new product, the Premium Gold Card w/5 Key Tags has the same discount options as the back of a Gold Card, but also comes with 5 Key Tags, which are stepped up offers. Maine Athletic Fundraising has signed excellent Key Tag offers, and as a result, this product has become our most popular…please call us for details! The Premium Gold Card w/5 Key Tags sells for $20. Classic Gold Cards are completely custom to your school, team, or whatever organization you are working with. Gold Cards provide a connection between your organization and the community as well. We provide the discounts on the back of the card and maintain a relationship with the businesses. There are 24 local discounts that can be used as many times as possible until they expire. Our Classic Gold cards also come with 1-3 Key Tags for added value. The Classic Gold Card sells for $10. A Ticket Package is a discount product with 48 or 64 removable coupons with merchant discounts. The 12-merchant Ticket Package sells for $10, and the 16-merchant Ticket Package sells for $20. There are 4 discounts per merchant. Again, we obtain the local discounts for this product. You will have access to additional online discounts if you sell the ticket. 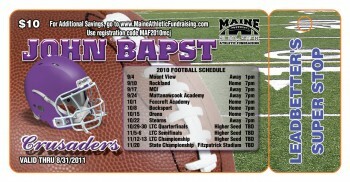 We can customize this product with a picture and your team’s schedule. A Pocket Pass showcases one merchant and comes with 18-24 coupons. Our Pocket Passes are extremely popular. A Pocket Pass sells for $10.